Established in 1948 (as Ogilvy & Mather with the merger of London-based Mather & Crowther and David Ogilvy’s New York-based agency), Ogilvy is one of the most well-known ad agencies in the world… although, I think, they are not called ad agencies anymore. Ogilvy is an “integrated creative network” of 131 offices in 83 countries providing services across six core capabilities: Brand Strategy, Advertising, Customer Engagement and Commerce, PR and Influence, Digital Transformation, and Partnerships. 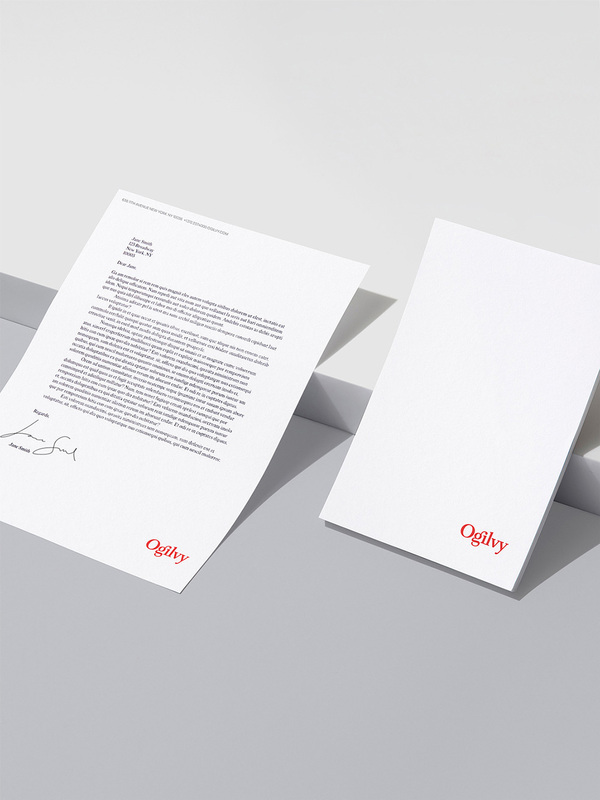 Yesterday, June 5, Ogilvy announced a “re-founding”, a global transformation “designed to clarify the company’s purpose, simplify its structure, and unify behind one single brand: Ogilvy.” The strategy and identity for the new Ogilvy were done by New York, NY- and San Francisco, CA-based COLLINS. Ogilvy offices around the globe already define a powerful creative network, but additional steps were needed to align this network with the needs of the future. As the company dissolved internal obstacles and divisions, COLLINS began building new strategic positioning and internal cultural values. Creativity could no longer remain the domain of any “creative department.” Each employee, regardless of their individual skill set, would now be charged with driving the company’s creativity, overall. Old Ogilvy values (red), New Ogilvy values (pinkish red). I guess that before we get into the logo and applications I should acknowledge the “re-founding” initiative as everything hinges on this reboot. I’ll start by admitting my own bias towards ad agencies, which is that I don’t find them remotely as interesting as they find themselves. It’s an industry that I feel makes way too much ado about every single thing they do: “Ad agency makes new hire!”, “Ad agency wins new piece of business!”, “Ad agency poaches creative director from other ad agency!”, “Ad agency wins big at Cannes!”. They make us graphic designers look humble. I am sure the re-founding means a lot to people at Ogilvy and probably to their clients and has important business ramifications but, from the outside (and with a strong, personal tinge of skepticism), it feels like yet another “Ad agency screams for attention!” boy-who-cried-wolf effort. But I can also be an optimist every now and then and if this re-founding translates into great workplaces that ditch the traits of old agencies and that generate meaningful work for the benefit of their clients and the entertainment of those clients’ audiences, then, yeah, let’s re-found the heck out of this. Before and after of what I thought was the official before logo. 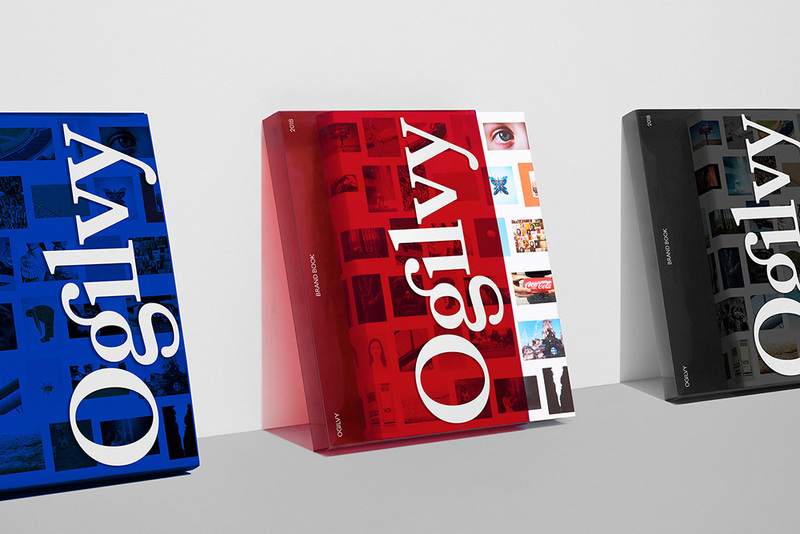 Like our strategic work, the visual identity system has its roots in Ogilvy history. The new logo transitioned from David Ogilvy’s signature — the mark of one person — to a redrawn version of the existing corporate typeface, Baskerville — thus becoming the mark of many people. I will also admit early on that I am totally confused about what the “before” logo was, or even what the official name of the company was. 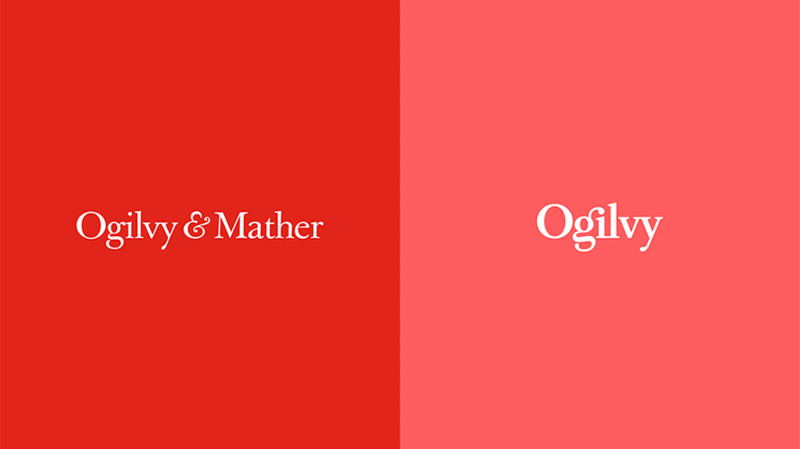 Scratchy signature logo vs. serif wordmark logo and “Ogilvy” vs. “Ogilvy & Mather”, which one? I thought the signature logo was the logo but the serif one is the one that has been presented as the before. I never quite liked the signature version because it wasn’t a great signature but I guess it looked “creative”. The full name in a serif version was fine but there was nothing interesting or memorable about it. The new logo — let’s first celebrate that this isn’t a geometric sans! — is a really nice bit of typography, with a lovely “gi” ligature being the center of attention and, as corny as it sounds, yes, the moment I saw it, I thought “Connected”… I think that the “gi” ligature is an elegant metaphor for building connections whether it’s internally, between agency and client, or between client and audience. I didn’t notice the “il” and “vy” ligatures at first glance, which is a compliment actually because they feel natural, they are very well resolved, and they do what ligatures are meant to do, which is to diminish inelegant counter spaces between certain letters that would otherwise yield problematic kerning. Long way of saying, this is a really nice logo that looks elegant and is visually interesting in a subtle way vs. the look-at-me-I’m-cool approach of the old signature logo. 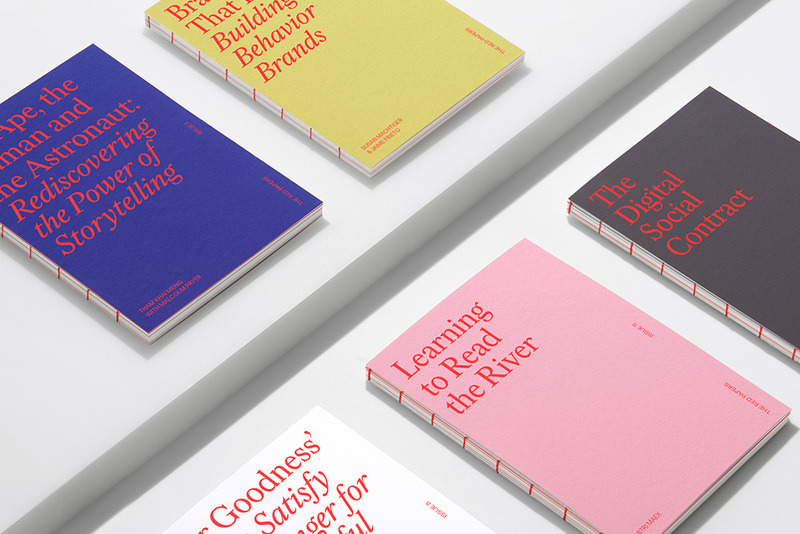 Two complete custom typefaces, an updated Baskerville and a modern sans serif, give the company an improved readability in both digital and analog environments. 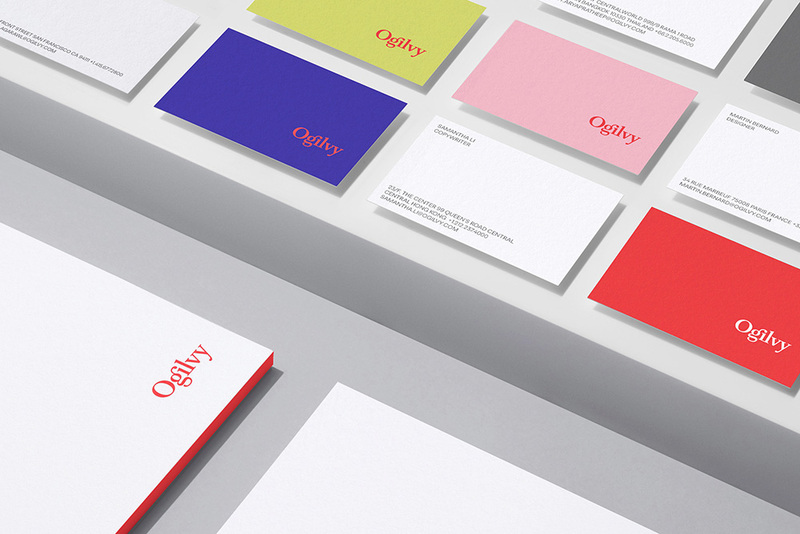 A dynamic color palette raises the vitality of all Ogilvy materials. And updated linguistic standards aim to bring new rigor to the company’s voice. Custom type families, designed by MCKL Type. The two new type families are very nice. Especially the serif, which is in a now-rare traditional Baskerville style that everyone and their mother is avoiding but here has a fresh liveliness. The sans has a bit of that Brutalist hipness to it (more evident in application) but overall it’s quite good and its numerals are super nice (see t-shirt shot at the end). The applications are good; they have a nice balance of looking elegant and serious but can also take a subtle renegade turn that gives Ogilvy a bit of an edge to compete against the more “disruptive” ad agencies out there. Overall, personal biases aside (and perhaps if I put myself in the shoes of an invested employee or client of the agency), this is a strong evolution that doesn’t come across as trying hard to be cool, hip, or millennial-pleasing but instead positions Ogilvy as a confident leader in its industry. Established in 1948 (as Ogilvy & Mather with the merger of London-based Mather & Crowther and David Ogilvy's New York-based agency), Ogilvy is one of the most well-known ad agencies in the world... although, I think, they are not called ad agencies anymore. 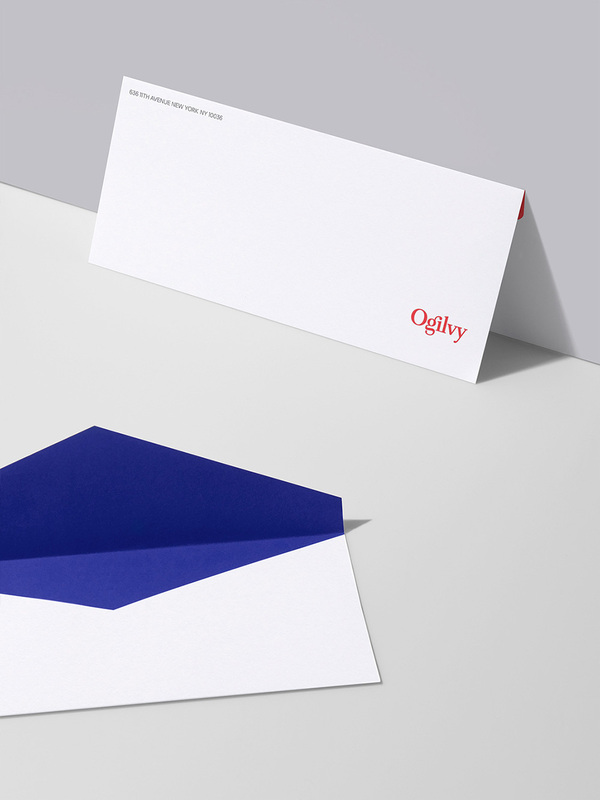 Ogilvy is an \"integrated creative network\" of 131 offices in 83 countries providing services across six core capabilities: Brand Strategy, Advertising, Customer Engagement and Commerce, PR and Influence, Digital Transformation, and Partnerships. 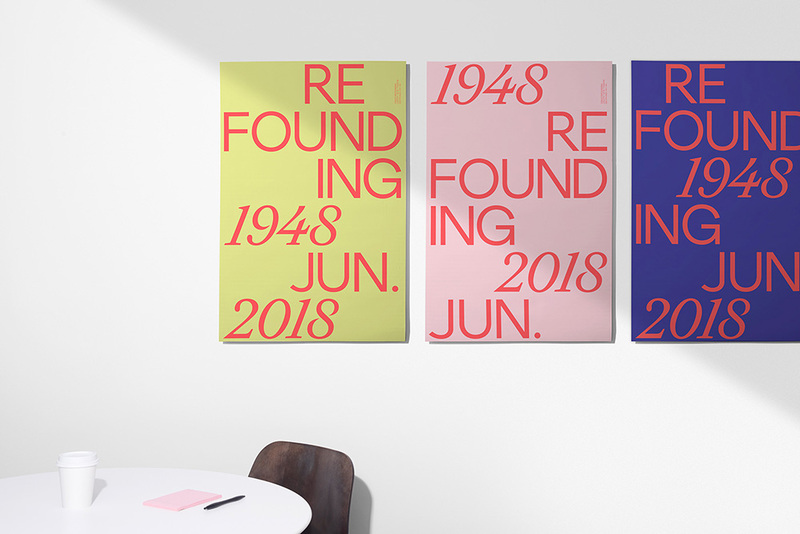 Yesterday, June 5, Ogilvy announced a \"re-founding\", a global transformation \"designed to clarify the company's purpose, simplify its structure, and unify behind one single brand: Ogilvy.\" The strategy and identity for the new Ogilvy were done by New York, NY- and San Francisco, CA-based COLLINS.